Beauty is always in the eye of the beholder, and that's certainly true of restaurant dining rooms. Your idea of a gorgeous restaurant might be a beautifully turned out, white-tablecloth dining room in Knightsbridge; or, your idea of beauty might be something that looks closer to the dazzling, neon-drenched God's Own Junkyard in Walthamstow, all pink and blue lighting reflecting off of rain-soaked pavements. 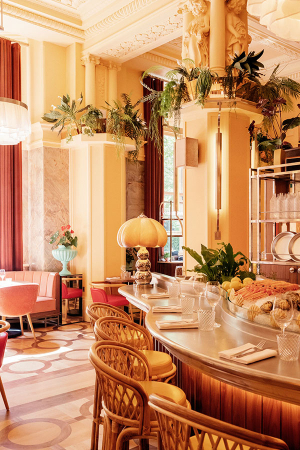 The good thing is that you don't have to choose: London's home to a massive array of restaurants that are beautiful in their own way. 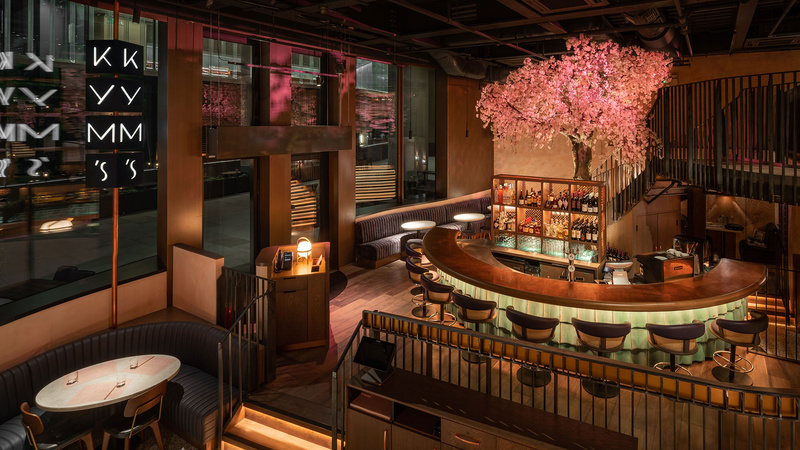 So we've picked out some of our favourites, from a modern Chinese restaurant dining room bedecked by a sprawling blossom tree to a modern relic in Soho jazzed up with urban art. Enjoy (and save some gawping time to enjoy the food, as well). A £20m budget, one car lift and three floors – Hide might be one of the most extra restaurants in London, but all the effort (and cash) that got it to this point has had staggering results. Just take a look at the glittering, eggshell lights, the half-a-million-pound winding staircase handmade from one single tree, which looks like something out of The Lord of the Rings, and the literary art installations decorating the private dining rooms. This place has serious style, and that’s before we’ve even taken Ollie Dabbous’s newly Michelin-starred food into account. Arguably the most exciting restaurant in Bloomberg's sparkling new HQ in the City is Kym's, the long-awaited second restaurant from renowned chef Andrew Wong is a world apart, interiors-wise, from his first, A. Wong in Pimlico. Kym's swaps a tight, down-to-earth dining room for an expansive, breezy space, decked out in soft pink lighting, marble tables, a gorgeous bar counter and a brilliant set piece: a cherry blossom tree in one corner that cascades its petalled branches over the dining room below. The bright lights of Soho shine their brightest in Old Compton Brasserie. 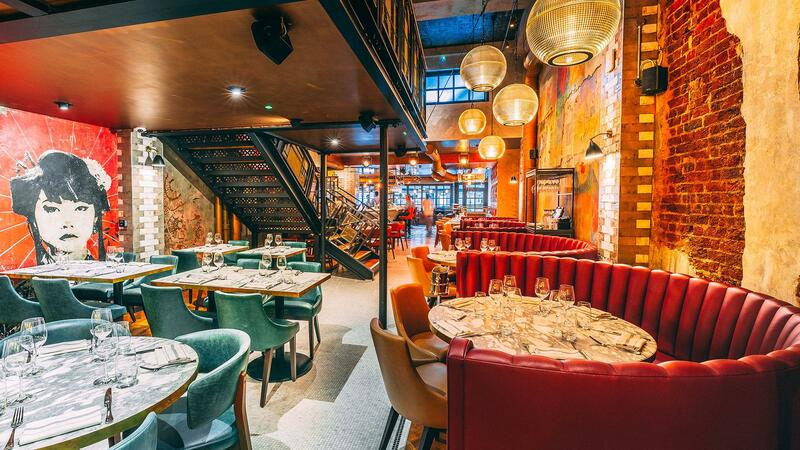 Located on perennially lively Old Compton Street, this buzzing and vibrant restaurant is decorated with bespoke artwork from local street artists, pop paintings of iconic Soho celebs and urban pieces that memorialise Soho’s unique history. Plus, the food menu features an inventive range of British favourites, and the cocktails are curated by acclaimed mixologist Matt Whiley (aka The Talented Mr Fox). Can’t say no to that. 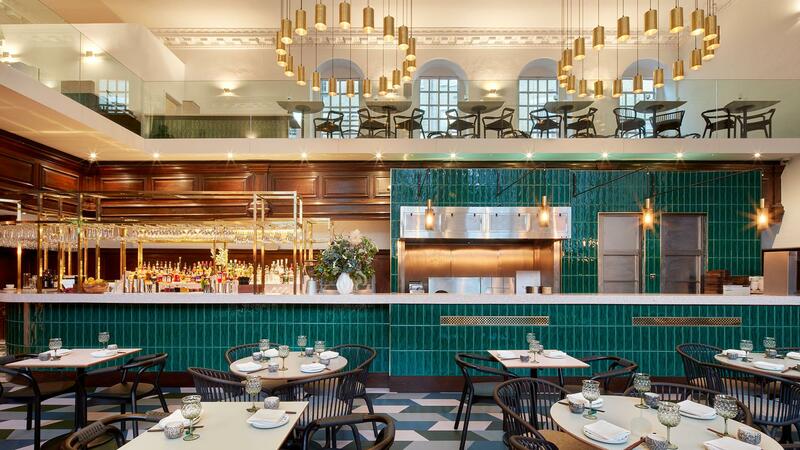 No, this isn’t an insight into a trendy millennial's Pinterest account – this is Duddell's London, the Cantonese restaurant from Hong Kong that’s set up in historic St Thomas’ Church in the heart of London Bridge. Flooded with natural light and the golden twinkle of four grand chandeliers, Duddell's is a proper looker. If you have a thing for floors, this place is for you. If you have a thing for dim sum, this place is for you. And if you have a thing for elegant cocktails served in even more elegant spaces, this place is also for you. It might position itself as a 'modern, seafood-focused neighbourhood restaurant', but there's no denying what Neptune really is: a luxury hotel restaurant – and one with serious, in-your-face style at that. In fact, it's all a bit #AccidentallyWesAnderson up in here. But you know what? It works. There’s a kind of nostalgic, ostentatious romance to chef Brett Redman (of Jidori and Elliot’s Cafe) and stylist Margaret Crow’s softly lit, peach-hued space with its Australia-by-way-of-California menu. 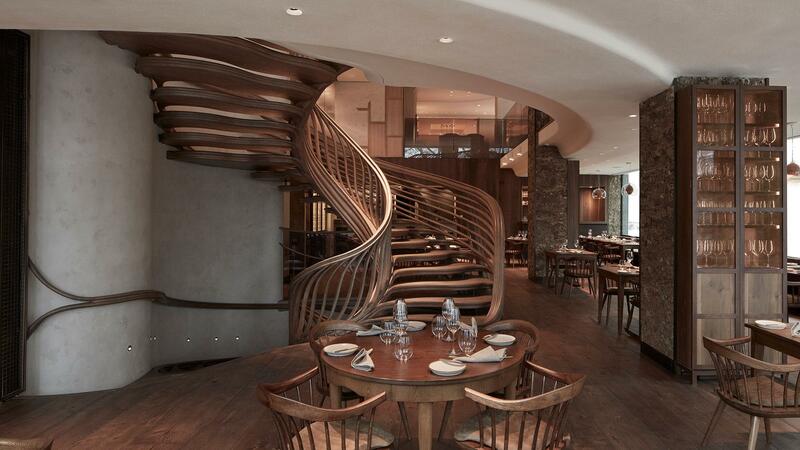 This Japanese-Chinese fusion restaurant is situated in the listed former London Port of Authority headquarters. What does that mean? Well, it means you’ll find yourself walking through an enormous, pillar-flanked entrance just to access the place, then taking a seat in an off-the-chart elegant dining room inspired by the building’s heritage as a gateway for merchants from the east and west. Exquisite oriental panels hang against marble walls, and the bar area has been known to be adorned with real cherry blossom.